Objective The efficacy of anti-tumour necrosis factors (anti-TNFs) in patients with Crohn's disease (CD) and symptomatic small bowel stricture (SSBS) is controversial. The aim of this study was to estimate the efficacy of adalimumab in these patients and to identify the factors predicting success. Design We performed a multicentre, prospective, observational cohort study in patients with CD and SSBS. The included patients underwent magnetic resonance enterography at baseline and subsequently received adalimumab. The primary endpoint was success at week 24, defined as adalimumab continuation without prohibited treatment (corticosteroids after the eight week following inclusion, other anti-TNFs), endoscopic dilation or bowel resection. The baseline factors independently associated with success were identified using a logistic regression model, leading to a simple prognostic score. Secondary endpoints were prolonged success after week 24 (still on adalimumab, without dilation nor surgery) and time to bowel resection in the whole cohort. Results From January 2010 to December 2011, 105 patients were screened and 97 were included. At week 24, 62/97 (64%) patients had achieved success. The prognostic score defined a good prognosis group with 43/49 successes, an intermediate prognosis group with 17/28 successes and a poor prognosis group with 1/16 successes. After a median follow-up time of 3.8 years, 45.7%±6.6% (proportion±SE) of patients who were in success at week 24 (ie, 29% of the whole cohort) were still in prolonged success at 4 years. Among the whole cohort, 50.7%±5.3% of patients did not undergo bowel resection 4 years after inclusion. Conclusions A successful response to adalimumab was observed in about two-thirds of CD patients with SSBS and was prolonged in nearly half of them till the end of follow-up. More than half of the patients were free of surgery 4 years after treatment initiation. Clinical Trial registration number NCT01183403; Results. Stricture is the most common complication in small bowel Crohn's disease (CD). Magnetic resonance enterography is useful to diagnose and define both the extent and functional impact of an intestinal stricture. The efficacy of anti-tumour necrosis factors in patients with CD and symptomatic small bowel stricture is controversial. Adalimumab treatment is successful in 2/3 of CD patients with symptomatic stricture at week 24. Success is maintained in 1/3 (29%) of the patients after a median follow-up time of 4 years among the whole cohort. More than half of the patients were free of surgery 4 years after treatment initiation. We found an easy-to-use predictive score of adalimumab success, based on clinical and imaging factors. Our findings indicate that adalimumab is an efficient treatment in symptomatic small bowel stricture associated with CD. Our score helps in making a factual decision between medical or surgical treatment rather than empirical. Medical therapy may treat the inflammation, but endoscopic treatment or surgery is often necessary to relieve small bowel obstructions due to stricturing lesions.4 Anti-tumour necrosis factor (anti-TNF) agents, such as infliximab and adalimumab, are efficient drugs to induce and maintain remission in patients with CD. However, conflicting data have been published about the efficacy of anti-TNFs in patients with stricturing CD.5 There have been concerns regarding the use of anti-TNFs in patients with established strictures. Indeed, several reports have suggested that they increase the risk of intestinal obstruction.6–8 However, data from the TREAT registry and the ACCENT I infliximab maintenance trial did not show an increased risk of obstruction in patients with or without intestinal stricture at baseline.9 Moreover, other studies have found that anti-TNFs could lead to a clinical response and stenosis reversal.10 ,11 No definite conclusions can be drawn from these studies especially due to their small sample size and retrospective design. It would therefore be useful to have predictive markers of anti-TNFs efficacy in patients with intestinal strictures due to CD. Magnetic resonance enterography (MRE) is useful to diagnose and define both the extent and functional impact of an intestinal stricture, particularly when it concerns the small bowel beyond the reach of the colonoscopy. It has a fair to good sensitivity and high specificity for the diagnosis of small bowel strictures.12 MRE may also be used to assess the degree of inflammation and monitor the response to drug therapy.13–15 But whether it may predict the response to treatment has not been evaluated in patients with CD who have intestinal strictures. In this study, our aims were to estimate the success rate of adalimumab treatment in patients with CD and symptomatic small bowel stricture and to identify factors predicting success. Investigators from the Groupe d'Etudes Therapeutiques des Affections Inflammatoires Digestives (GETAID) designed this prospective, multicentre, open-label, postmarketing observational study. This study is registered on ClinicalTrials.gov, no. NCT01183403. To be included, patients had to be at least 18 years of age and meet the following inclusion criteria: (a) a diagnosis of CD according to the usual endoscopic, histological and imaging criteria;1 (b) a single or several small bowel (duodenum, jejunum or ileum) stricture(s) defined according to Montreal classification as ‘occurrence of constant luminal narrowing with prestenotic dilatation or obstructive signs/symptoms’ and identified by radiological imaging or endoscopy; (c) obstructive symptoms within the last eight weeks, except if only (i) mild to moderate pain (postprandial abdominal pain or increased by diet, improving with abdominal noise), without nausea, vomiting and abdominal cramps and (ii) diet restrictions without abdominal pain; (d) failure/contraindications steroids and/or immunosuppressive agents and indications for anti-TNFs. We excluded patients with surgical obstruction, intra-abdominal abscess, isolated colonic stricture, change in the CD treatment during the previous two months (azathioprine, 6-mercaptopurine, methotrexate), exposure to anti-TNFs within the last 12 months and contraindications to MRE or anti-TNFs (positive chest radiograph for tuberculosis or a positive tuberculin skin test; bacterial or viral infection; history of myocardial infarction, heart failure or malignant disease in the past five years (except for basal-cell skin cancer) and demyelinating neurological disease). MRE was performed at baseline in all patients on 1.5 or 3 T systems. All MRE were performed after the oral administration of 1200 mL of hyperosmotic water solution. Mandatory sequences were breath-hold imaging performed in the coronal plane using a T2-weighted single-shot turbo spin echo sequence and a true Fast Imaging with Balanced Steady-state sequence and (after intravenous administration of an antispasmodic agent) a T1-weighted sequence before and 90 s, as well as 8 min after an intravenous injection of gadolinium chelates. Ninety seconds was considered to be the parenchymatous time and 8 min the delayed enhancement time. All radiologists were invited to participate in a specific meeting that included a systematic review of all MRE criteria observed in patients with CD and a dedicated digital video disc which included the items were distributed to the participating centres. All the characteristic MRE criteria described in the literature and known from clinical experiments were noted by the local radiologist, but the results were not transmitted to the clinician investigator except to confirm the stricture and the absence of contraindications to anti-TNFs (abscess, tumour). Blind, internal or cutaneous fistula were not considered as contraindications to participate to the study provided that there was no associated abscess. Adalimumab was administered subcutaneously at baseline (week 0) at a dose of 160 mg, followed by 80 mg at week 2, and then 40 mg every other week. Those who were under immunosuppressors were maintained for the study, and those who were under steroids were tapered at the discretion of the clinician. Patients were assessed using the Crohn's Disease Activity Index (CDAI), complete blood cell count and C reactive protein (CRP) serum level within the three weeks before inclusion and at weeks 8, 16 and 24 or at study withdrawal. Obstructive symptoms were graded using the Crohn's Disease Obstructive Score (CDOS), built by the authors' clinical experience (YB, FC, and Marc Lemann in memoriam) taking into account the characteristics of obstructive pain (duration, intensity), associated signs (nausea, vomiting), dietary restriction and hospitalisation, graded on a scale of 0–6 (table 1). CDOS was measured at weeks 0, 8, 16 and 24. The follow-up continued after week 24 or study withdrawal with recording of adalimumab withdrawal for failure/intolerance and dilation for patients who were in success at week 24, and for surgical resections for all patients. The primary endpoint was the success at week 24, defined as adalimumab continuation with all the following criteria: (a) no use of a prohibited treatment (corticosteroids after the eight week following inclusion, parenteral nutrition, other anti-TNFs); (b) no endoscopic dilation; (c) no bowel surgery for resection of small bowel stricture; (d) no severe adverse events leading to adalimumab withdrawal and (e) no study withdrawal whatever the reason. The secondary endpoints were the levels and variations relative to baseline of the CDAI, CDOS and CRP level at weeks 8, 16 and 24. Predictive factors of success at week 24 measured at baseline were looked for in order to develop a prognostic score of success. All patients in success at week 24 were monitored until the end of follow-up, and the time-to-adalimumab failure, defined as adalimumab withdrawal whatever the reason, or the need for endoscopic dilation or surgical resection was noted. In addition, time to surgical resection was studied within the whole cohort. We calculated that a minimum of 80 patients was required to detect an OR of success >2.0 or 4.0 with a power of 80%, which was dependent on the adalimumab success rate being between 50% and 70% and on the proportion of patients in the good prognosis group being between 25% and 75%. Since coefficients varied around 1.55 between 1.22 and 1.99, a prognostic score with the same weight for all variables was chosen for simplicity. According to the coefficient estimates in the multiple logistic regression model, we built a score in which we attributed one point for each item. To assess the quality of the prognostic score, patients were classified as having a poor, intermediate or good prognosis according to two limits. The proportions of patients correctly classified as success in the good and in the good or intermediate prognostic groups, and as failures in the poor prognosis group were estimated from 1000 bootstrapped samples of 97 patients (uniform selection with replacement).19 The proportions of patients with prolonged success as a function of the follow-up time and time to surgery were calculated from week 0 using the Kaplan-Meier method.20 The closing date for the data analyses was 31 December 2014. The statistical analyses were carried out using the SPSS V.19.1 statistical software program (SPSS, Chicago, Illinois, USA). From January 2010 to December 2011, 105 patients from 20 GETAID centres from France and Belgium and 1 Italian centre were screened. Eight patients were not included in the study due to loss of follow-up (n=5), withdrawal of consent (n=2) or presence of luminal abscess (n=1) before inclusion, and were not analysed. Ninety-seven patients were included and analysed. The baseline characteristics of the 97 included patients are described in table 2. All 97 patients had a stricturing phenotype (B2), according to the Montreal classification of the lesions of CD2 at inclusion, and 41 (42%) were treated with immunosuppressive agents (thiopurines, methotrexate) at the time of adalimumab initiation. The CDOS was >4 (ie, severe abdominal pain for >1 week, mild to moderate abdominal pain every day that was associated with nausea, vomiting, abdominal cramps for >3 days or hospitalisation during the eight previous weeks) in 59 (61%) cases. The locations of small intestinal strictures are reported in online supplementary table 1S. There was a single stricture in 69/97 (71%) patients, located in the ileum in 50/69 (72%). A previous endoscopic dilation had been performed in 16/97 (16%) of the patients. The baseline MRE features are reported in table 3. In total, 62 out of the 97 patients (64%) reached success at week 24. In total, 35 patients failed to achieve success and were switched to infliximab, 8 patients underwent an intestinal resection, 2 patients had an endoscopic dilation, 10 patients had a severe adverse effect leading to adalimumab discontinuation, 2 patients interrupted adalimumab treatment and 5 patients withdrew from the study (four were lost to follow-up, one withdrew consent). In eight cases, the failure was due to multiple reasons. The values and variations of the CDOS, CDAI and CRP from week 0 to week 24 and at the end of follow-up are shown in online supplementary tables 3S and 4S. Among the 62 patients in success at week 24, 88% had a CDAI <150. As shown in online supplementary table 4S, CRP was significantly associated with response in univariate analysis, but not in multivariate analysis. Faecal calprotectin was measured in 44 (45%) patients at baseline; its mean value (SD) was 408 (780). Online supplementary tables 4S and 5S summarise the clinical, laboratory and imaging factors associated with success determined using a univariate analysis. Table 4 describes the prognostic factors that were independently associated with success. These were the use of immunosuppressive agents at the time of adalimumab initiation, the presence of obstructive symptoms for <5 weeks and a CDOS >4. The MRE items were a small bowel stricture length of <12 cm, a maximal small bowel diameter proximal to stricture(s) of 18–29 mm, a marked enhancement on delayed phase and the absence of a fistula. The numbers and proportions of observed success for the three groups defined by the prognostic score are described in figure 1. The observed probability of success at week 24 in 93* patients with Crohn's disease and symptomatic small bowel stricture(s) according to the clinicoradiological prognostic score†. *93 of 97 patients had a delayed T1weighted sequences; +for details see table 3. As estimated with the 95% CI from the bootstrap method, the percentage of success among the 49 patients (range 35–67) of the good prognostic group was 88.1 (84.3–91.4) and in the 77 patients (range 65–88) of the good or intermediate prognostic groups was 77.7 (74.4–81.3). The percentage of failure (non-response) among the 16 patients (range 5–28) in the poor prognostic group was 94.4 (90.9–100.0). Based on these results, patients with a score of two points or fewer were considered to be unlikely to respond to adalimumab, while those with a score of four points or more were considered to be likely to respond to adalimumab, and those with a score of three points were in between. The median±SE follow-up time was 3.8±0.1 years. Figure 2 shows the long-term follow-up of the 62 patients who had reached success with adalimumab at week 24. Thirty-three failures were observed and the proportion±SE of patients with prolonged success (still on adalimumab, without dilation and without surgery) was 45.7±6.6% at 4 years (11 patients still at risk), that is, 29% of the whole cohort. Online supplementary figure 1S shows the time-to-intestinal resection from inclusion in the whole sample. 56.6%±5.0% and 78.3%±4.2% achieved success and were surgery-free at week 52, respectively (figure 2 and online supplementary figure 1S). Forty-six patients were operated on and 50.7%±5.3% of the patients had not been operated 4 years after inclusion (21 patients still at risk). Among patients who were in success at week 24, 21 intestinal resections were subsequently performed and 64.9%±6.6% of the patients had not been operated 4 years after inclusion (18 patients still at risk). 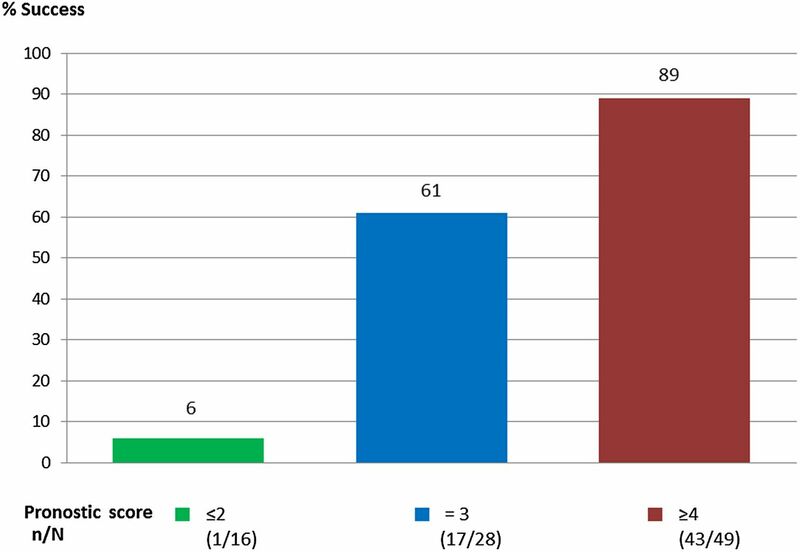 Time to failure in the 62 patients with Crohn's disease and symptomatic small bowel stricture(s) following the successful response to adalimumab at week 24 (33 observed failures, median±SE follow-up time 3.8±0.1 years). Serious adverse events were reported in 70/97 (72%) patients (table 5). One patient had pancytopenia due to myelodysplasia 1 month after adalimumab initiation combined with azathioprine. The patient died at the age of 81 years, 12 months later in spite of treatment withdrawal. No other death or serious opportunistic infections were reported. Three patients were pregnant during the study and interrupted the treatment. In this study, attempting to address a significant clinical problem in an area of unmet need, we showed that adalimumab treatment was successful in 64% of CD patients with symptomatic stricture at week 24. Success was maintained in 29% of the whole cohort after a median follow-up time of nearly 4 years. We also propose a predictive score of adalimumab success based on clinical and imaging factors. The present study was designed to evaluate the efficacy of adalimumab in patients with symptomatic small bowel stricture and to identify clinical and imaging factors predicting its success. To evaluate the success, we used a composite score considering all the essential elements to judge the effectiveness of treatment in clinical practice, with the maximum of objective criteria such as the use of a prohibited treatment, endoscopic dilation, bowel resection, serious adverse event or study withdrawal. We assessed the primary endpoint at week 24 because it was one of the two primary endpoints in the pivotal CHARM trial.28 Moreover, in a similar pilot study including 20 patients with ileal CD treated with infliximab, the primary endpoint was at week 26.13 We felt that an earlier assessment would have been too short to assess the response to adalimumab in patients with severe intestinal lesions. We also considered that clinical outcome including treatment efficacy and tolerance was better indicators for success than radiological changes. 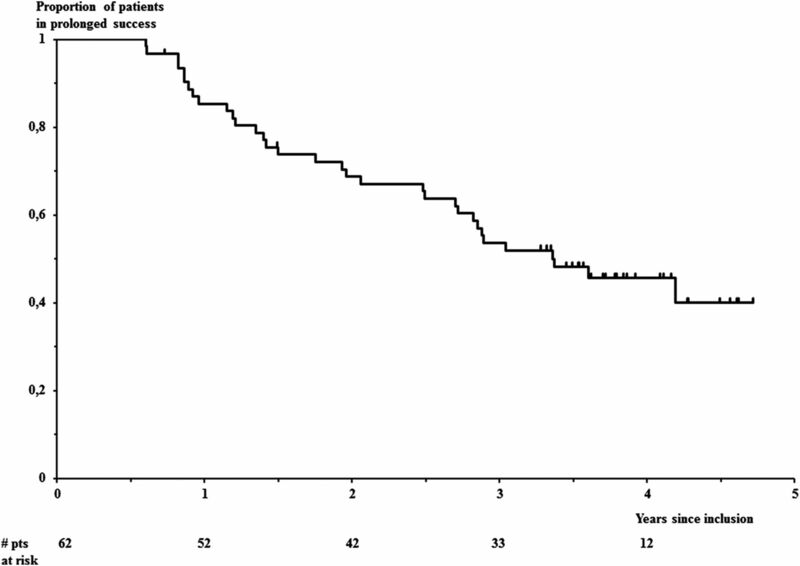 Van Assche et al13 defined an MRE obstructive score and did not find any modification of this score at week 26 after anti-TNF (infliximab) treatment in a cohort of 20 patients with ileal CD. Approximately two-thirds of the patients reached clinical success at week 24. We found that the combined treatment with adalimumab and immunosuppressive agents was associated with an increased probability of success than adalimumab alone. Such result should be confirmed in a randomised controlled clinical trial. The efficacy of combotherapy has been well demonstrated for infliximab in patients with CD, but is less clear for adalimumab.29 ,30 We also found that recent and severe obstructive symptoms were associated with treatment success. In fact, long-standing and non-severe obstructive scores may reflect irreversible intestinal damage, with a lower probability of success.31 We found that a total stricture length of <12 cm, an intermediate dilation of the small bowel proximal to the stricture(s), a marked enhancement on delayed phase and the absence of fistula were associated with success. These factors could potentially reflect reversible and non-severe strictures. Although delayed MRE signs are more often due to fibrosis than inflammation, only the marked (vs mild–moderate or nil delay) enhancement was predictive.32 However, marked enhancement on delayed phase might indicate severe inflammation, and a clear distinction based on standard MRE criteria is not currently possible.22 ,26 An intermediate small bowel dilation above the stricture predicted success as well. The presence of major dilation is usually considered as a late sign and is generally thought to be due to irreversible intestinal damage. The reason why a normal intestinal diameter had the same significance is unclear, but may reflect more functional symptoms that are non-responsive to anti-TNFs. Alternatively, some patients with severe intestinal obstruction may have frequent vomiting and consequently no dilatation above the stricture. Unsurprisingly, the absence of a fistula, observed in 75% of our population, also predicted success. CRP was found significantly associated with response in univariate analysis, but not in multivariate. Moreover, the relation found was on the opposite of what was expected as low CRP (<5) was associated with high rate of success. Therefore, what is true for luminal disease is probably false for stricturing disease, a result that needs to be confirmed. The strength of our study is its design based on robust evaluation criteria. The study was adequately powered to detect prognostic factors and it correctly anticipated the success rate. Prognostic factors associated with success were identified and allowed us to build an easy-to-use clinical and imaging prognostic score. The prognostic score dichotomised the cohort into patients with a score of two points or less who were very unlikely to respond to adalimumab (6%), and those with a prognostic score of more than two who have a very high (87% with a prognostic score of four or more) or high (78% with a score of three or more) probability of success. The internal validity of this score was confirmed using a bootstrap analysis. Our study has some limitations. First, it is an uncontrolled, observational study. However, according to current European recommendations21 mentioned earlier, surgery should have been considered for all patients in this group without knowledge of any specific criteria. A controlled trial of anti-TNF versus surgery is needed to assess which is the best option to preserve quality of life. Second, the CDOS was empirically constructed and its operative properties are unknown. Third, MRE was not interpreted using a central reading system and the inter-radiologist variation of these items is unknown. However, as mentioned, all radiologists participated in a specific meeting before the launch of the study. Fourth, faecal calprotectin was measured in <50% of patients at baseline, and statistics could not be performed for this parameter. Finally, the prognostic score has not yet been validated in an independent cohort. In conclusion, adalimumab success was observed at week 24 in about two-thirds of CD patients with symptomatic small bowel stricture and prolonged in nearly half of the patients in success at week 24, that is, a third of the whole cohort after a median follow-up of nearly 4 years. More than half of the patients initially treated with adalimumab were still free of surgery 4 years after treatment initiation. The authors thank Christine N'Guyen, Cendrine Chaffaut, Claude Matuchansky.
. Treatment of small bowel subocclusive Crohn's disease with infliximab: an open pilot study. Acta Gastroenterol Belg 2007;70:15–19.
. Intestinal strictures complicating initially successful infliximab treatment for luminal Crohn's disease. Am J Gastroenterol 2000;95:2503–2503.
. Linear models (statistic). In: ed. CRC Press Taylor&Francis Group, Modelling binary data. London: Chapman & Hall, 1991, pages 47–49.
. Identification of prognostic factors. In: Buyse ME, Staquet MJ, Sylvester RJ, eds. Cancer clinical trials, methods and practice. Oxford University Press1988;423–3.
. An introduction to the bootstrap. New York: Chapman & Hall, 1990. Collaborators The GETAID CREOLE Study Group: In addition to the authors: Lionel Arrive, Alexandre Aubourg, Audrey Baillon, Guillaume Baudin, Laurent Beaugerie, Julie Bolivar, Vanessa Brun, Anthony Buisson, Guillaume Cadiot, Patrick Chevalier, Jean Frédéric Colombel, Muriel Cuilleron, Jean Louis Dupas, Jérôme Filippi., Bernard Flourié, Eric Frampas, Mathilde Gayet, Jean Marc Gornet, Constance Hordonneau, Bruno Lapuyade, Valérie Laurent, Christophe Leroy, Maïté Lewin, Philippe Otal, Ammar Oudjit, Yves Panis, Benjamin Pariente, Béatrice Scotto, Marion Simon, Xavier Treton, Pierre-Jean Valette, Thierry Yzet, Anne Marie Zagdanski. Contributors YB, FC, and Marc Lemann in memoriam were jointly responsible for the study conception. YB, FC, Marc Lemann in memoriam and J-YM were jointly responsible for the design. YB and J-YM produced jointly the first draft of the report. J-YM was responsible for all statistical analyses. All authors took part in the revision of the report. YB and J-YM had full access to all of the data included in the study at study completion and had final responsibility for the decision to submit for publication. Funding This work was supported by a grant from Abbvie. GETAID/IMM-09-0068/CREOLE. Disclaimer The funders of the study had no role in the design of the study, data collection or analysis, interpretation of data, writing of the report or in the decision to submit the paper for publication. Competing interests Consultancies: BMS, Shire, Sanofi, Norgine Pharma, MSD, Abbvie, Astra Zeneca, Roche, Takeda Millenium, Janssen Cilag, Pfizer Stock ownership: Inception IBD, San Diego, CA, USA Honoraria: BMS, MSD, Abbvie, Teva, Ferring, Vifor Pharma, HAC, Mayoli-Spindler Paid expert testimony: Abbvie Patent applications: None Travel grants: Abbvie, MSD, Ferring, Takeda, Vifor Pharma. Ethics approval The Human Research Ethics Committee of Saint-Louis Hospital (Paris, France).